Mark was born in Everett and raised in Monroe Washington. He joined the Marine Corps a year after graduating High School and had the opportunity to see a good amount of the United States and the world as a KC-130 Aerial Navigator. He had the opportunity to see many exciting and interesting, albeit some dangerous, countries of the world as far west as Japan, above the Arctic Circle in Norway, east as far as Kuwait, and south of the equator along with a multitude of Military Bases around the globe. While greatly enjoying his travel and opportunities in the military; in his view; there are very few places that compare to beautiful Western Washington. Mark has always had an interest in graphic design and was fortunate to find full-time employment as a graphic designer in Seattle after his service in the Marines. After three years in the industry, his initiative led him to cofound DMgraphics in 1998; later incorporated as Efinity Technologies in 2001! As the company has grown over the years his role has transformed from graphics to programming, at which he excels and greatly enjoys. Perhaps his most significant work among many projects for our clients in the programming field is the fully supported Content Management System, VSM Tools, our CMS, which he largely wrote single handedly and which, with the help of our current team of programmers, he directly supports and enhances on an ongoing basis. This CMS runs and supports virtually every one of the well over 500 websites produced by Efinitytech since 2004 when it was first launched. Mark has numerous hobbies (too many really). He enjoys shooting, hiking/camping, and more recently custom furniture building. More than anything, Mark enjoys spending time with his wife and 6 children. 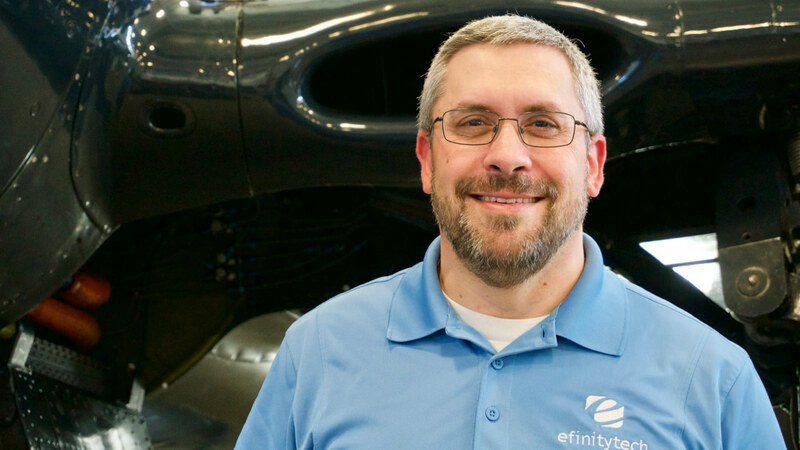 In addition to being the cofounder, President and Senior Programmer at Efinitytech, Mark also serves as a deacon of his church, Pinehurst Baptist, and serves as a Board Member on the Snohomish County Veterans Assistance Fund Executive Board.